"During the EU referendum, we campaigned across and beyond party lines for a progressive Remain vote. Now, we have a duty to provide continued opposition to Tory Brexit." Another Europe is Possible declaration. During the EU referendum, we brought together thousands of people all over Britain across and beyond party lines in order to campaign for a progressive Remain vote. Now, we have a duty to provide continued opposition to Tory Brexit. In the immediate term, that means demanding a democratic process, including recognising that Scotland and Northern Ireland voted remain, and demanding transparency in the Brexit negotiations. The British people have the right to know what their government is saying and negotiating. And it means demanding that any triggering of Article 50 is subject to proper democratic scrutiny. Our broader aims are now what they were during the campaign. We stand for a society run in the interests of people and the planet. We stand for an open society and a pluralist politics. The legal protections for the environment, workers, migrants and human rights provided by EU membership were limited, but on many levels they were vital, and they were the beginning of something better. We will campaign to retain and extend all of these hard won protections. We will also campaign to protect science, research and higher education, campaigning for Britain to ‘buy in’ to EU research budgets, to protect the right of the next generation to study at European institutions, and keep our own universities open to students from Europe. We stand unequivocally for continued and improved freedom of movement, and we will campaign for the rights of migrants and refugees at a time of growing domestic prejudice and international crisis. We are for solidarity between people and across borders. The struggle to win gains for ordinary people, and to democratise the European project, is our struggle – regardless of the outcome of the Brexit negotiations. What outcome are we campaigning for? Throughout the Brexit negotiations, we will argue for outcomes in line with these aims and principles – and we will do so in the spirit of democracy, accepting the result of the referendum but not giving up on our pro-European and internationalist values and aims. In this spirit, we will demand that in determining what Brexit really means, the people – not Theresa May’s administration – must have the defining say. We stand firm in our demand of a democratic debate and decision making which allows the the peoples of England, Northern Ireland and Wales (whether they be Leavers or Remainers) to participate fully, directly, or through their representatives, in the shaping of our destiny. We will organise our campaign on a broad basis, welcoming all stripes of progressive forces across political parties, ideologies and conceptions of a good society. Now that the referendum is over, we must commit our organisation to greater internal democracy – to include more people from the grassroots in the core organising, and to consult all of our supporters about what we do. 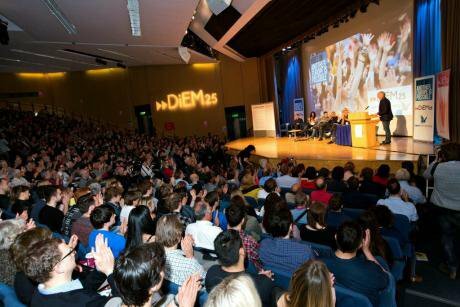 Another Europe Is Possible will seek to join forces with the Democracy in Europe Movement 2025 (DiEM25) on terms that enhance our capacity to demonstrate to the people of Britain that another Britain is indeed possible as long as European democrats reach out across national and organisational borders in search of shared democracy and shared prosperity. a. Another Europe is Possible calls for solidarity with refugees and asylum seekers, and with the frontline countries like Greece which lack resources to cope. All European states, including the UK, must co-operate to end the scandal of squalid camps and offer proper resettlement for refugees, with contributions proportionate to national GDP. b. Another Europe is Possible will seek to democratise itself and to give structure to its grassroots support. In the coming months, we will launch a review, consulting supporters and stakeholders, on our processes, structures, name, infrastructure and organisational form. This will conclude at a democratic event in early 2017. These other proposals were referred (due to lack of time) for further discussion in the run up to the next decision making meeting in January. a. If the government chooses to privilege the England and Wales Leave votes over the Scotland and Northern Ireland Remain votes, they risk a breakup of the UK and destabilisation in Ireland. A Greenland-style treaty could prevent this by respecting each country’s decision in the referendum. b. First campaign priority must be to ensure that HM Government does not make a formal declaration of the UK’s intent to withdraw from the EU without the prior-given express authority of Parliament, and that HMG makes clear its proposed ‘terms of exit’ before seeking such authority. c. Second campaign priority must be to itemise all the Regulations made under Statutory Instruments to implement EU Directives, where the power to act derives from the European Communities Act 1972, and which will have no legal effect once the UK ceases to be a member of the EU.